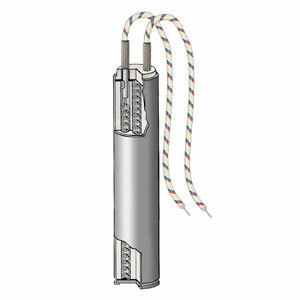 Click on this link if you need more information about Cartridge Heaters. Low-density cartridge heaters are an excellent, cost effective choice without compromising quality for Original Equipment Manufacturers (OEMs) consuming large quantities of cartridge heaters for their equipment. Note: model numbers above are for low density cartridge heaters terminated with Type F flexible leads, 254 mm (10") long. Ordering Example: LDC00417, 1000 W, 120 Vac cartridge heater. Note: * Low density cartridge heaters are UL recognized and CSA certified in many design variations under UL File Number E65652 and CSA File Number 043099. If you require UL and/or CSA Agency Approval, please specify when ordering. Dimensional Specifications Electrical Specifications **480V when applicable. Contact Omega. Note: Model numbers above are for low density cartridge heaters terminated with Type F flexible leads, 254 mm (10") long.